Have you ever suffered a lot from data loss? To avoid data loss or recover crashed system, you often need to create an image of your PC before computer breaking down. AOMEI Backupper (AB) Standard is an all-in-one backup software to back up your important files and create system images to protect your data. Multiple language features will help people around the world to use it. AOMEI Backupper is the easiest and faster back software for your PC. On its interface, you can see five tabs: Home, Backup, Restore, Clone and Utilities. AOMEI Backupper is the best backup software that supports system image backup, disk backup, partition backup, file backup.etc. 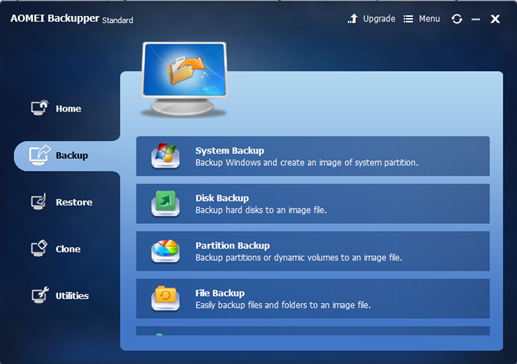 AOMEI Backupper 4.0.3 – the latest version of the free backup software. What’s new in Version 4.0.3? and again after setting up a scheduled task of syncing files to a network path. Backup system and create a system image to keep Windows and applications safe. Backup entire hard disk (HDD), SSD or specified partitions to create an image file. Backup or sync your most important files and folders on a regular basis. Set and forget with automatic backup, incremental/differential backups to save time and storage. Clone a smaller HDD to a larger HDD for disk upgrade, or clone HDD to SSD for better performance. Added real-time file sync: monitor files for changes and synchronize new added, modified or deleted files from source to target path as soon as the change has occurred. If your system is Windows 7, Windows 8.1, Windows 8 or Windows 10 (not XP or Vista), you can click here to free download AOMEI Backupper with smaller installation package size. You can also upgrade to the Pro version, which costs $49.95，the pro version offers additional features such as faster speed for backup and restore, or higher priority with the tech support.